Confucius had it right. Isn’t that what our job as a parent is? Getting our kids ready to leave the nest and prepare them for a life out on their own? And I believe the sooner we start, the more beneficial it will be for our children. I would love to share with you what I have observed and experienced recently when I was invited to bring our Lil’ S to People Impact. People Impact is the market leader in providing intelligence training to children which focuses on enhancing various soft skills, such as communication, heightening self-esteem, leadership skills, money and time management, arithmetic and linguistic reasoning, creativity and critical thinking. In a nutshell, it’s about building life skills for success! Many of us, parents here tend to skew towards IQ development for our kids, and in particularly zooming into academic excellence with the kind of competitiveness we have here. But, it’s definitely good to ponder upon what’s best for these little ones. What will make them happy and successful in their own right? I am glad I agreed to the invitation. My Lil’ S loved the program. The day she went for the trial, they were focusing on the theme, TEAMWORK. 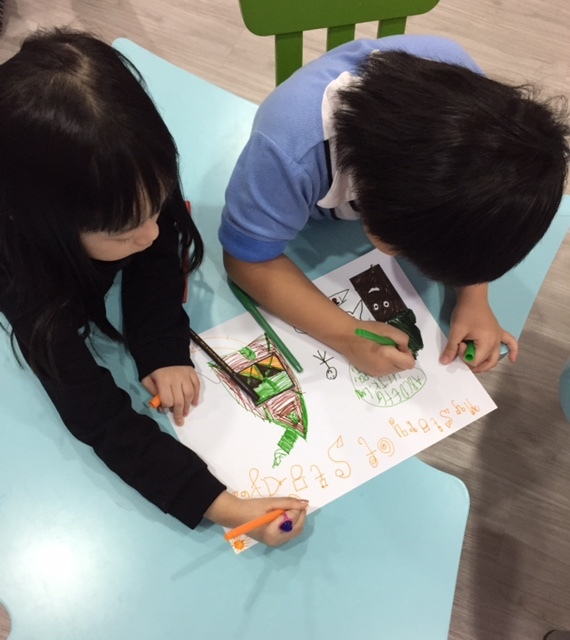 Love it or not, we have to work with others even at the tender age of kindergarten. So teamwork does matter. Teamwork requires people to work with others towards a unified goal. For a team to work together effectively, it takes all members of the team to respect each other’s abilities and opinions. People Impact’s IQEQ programme is specially designed to achieve the goal of instilling teamwork spirit in the kids. Lil’ S enjoyed all the activities on that day. People Impact encourages learning through play and I could see that very obviously during the lesson. Kids were asked to think creatively using shapes. For instance, my Lil’ S was asked what her favourite shape was, and she picked a heart shape. Then the teacher got her to expand on that shape, how she could magically turn that simple heart shape into something else. So she started drawing even more hearts within the big heart and eventually made it into a beautiful heart-shaped window! Then they had to work in pairs, working on shapes to tell a story. They had to stand in front of the class to show and tell, before that, they had to discuss the ideas with their partners. Adorable! And these kids really had such great imagination. Thereafter, they had to work in a bigger group for some ‘groceries’ shopping. My Lil’ S was appointed as the leader of the group and she had to make sure everyone in the team fulfilled their designated role well. From my observation, I can tell the objectives of all these activities are to allow our children to move from more intrapersonal ways of thinking to interpersonal communications with others. It will help strengthen their social and emotional skills, develop their communication skills, and improve confidence. These will eventually become part of them and such great assets to have for them to stand out and become successful positive individuals. For more information, do check out the following platforms of People Impact’.